What a queue-jumper Gabriele Tranchina turns out to be. A pile of CDs sits accusingly on my disk awaiting critical attention. I’d been sampling and tasting here and there, planning an orderly assault. But on Monday, Tranchina’s new album – A Song of Love’s Color (Jazzheads JH1176) – landed fresh from New York, inveigled its way onto my player and has been sitting there ever since, spinning an insistent spell, and demanding listen after listen. Think Lambert, Hendricks and Ross meet Pink Martini, with a dash of Astrid Gilberto, a streak of Ute Lemper, a hint of Mina and a sense of Anita Baker, and you can begin – just about – to anticipate the startling effect of Tranchina’s voice as she juggles rhythms, styles and languages to create a constantly shifting mood. One minute you’re chilling to late night jazz, the next you’re swept up in a Jobim samba, before being caught in the headlights of a hypnotic, almost Weill-ish lieder. All of which makes her a bit of a marketer’s nightmare – and precisely the kind of performer that Art of the Torch Singer loves. The cocktail of jazz, world music, vocalese and chant might well be overwhelming if it wasn’t for the relaxed consistency of the band, led by Tranchina’s husband Joe Vincent – who wrote several of the tracks and is responsible for the cool, spare arrangements. Tranchina clearly thrives on the freedom this gives her to swing between techniques and tones. The album kicks off with a Fugain/Delanoë chanson, “Chante Comme Si Tu Devais Mourir Demain”, which pretty much describes Tranchina’s mission. The title track follows, revealing her dexterity with a melody and some alluring phrasing. Later, a traditional Hindu prayer provides the basis for a swirling, syncopated chant that also includes a brief rap, “Asato Maa (Sat Chit Ananda)”, and a Spanish lullaby – “Duérmete Niño Bonito” – has an authentic, shuffling last-dance-of-the-night atmosphere. “Siehst du Mich” – a poem by Else Lasker-Schüler, set to music by Joe Vincent – concludes the album on a beautifully sombre, brooding note. 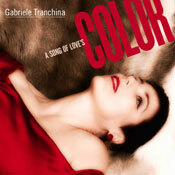 A Song of Love’s Color, mixed by Joe Vincent and Randy Klein, and mastered by Gene Paul, was recorded in New York in the summer of 2008. Its release is long overdue. Tranchina herself – German-born and New York-raised – remains something of an enigma, despite the stylish art work on the sleeve. A trawl around Youtube and MySpace yields nothing in the way of clips. Her people should do something about that fast, because once you’ve heard this you’ll want to know more about an artist who clearly has something different to offer the homogenised world of modern popular music.